If Hillary wins, we won’t have to worry about any intimidation of the Supreme Court. She will pack the SC with people who will be very happy to do her bidding. Justice Barack Obama, Justice Eric Holder, or Justice Valerie Jarrett, anyone ? 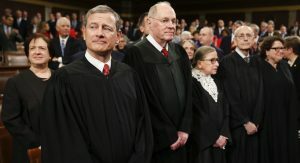 The WikiLeaks email disclosures make fascinating reading about the political calculations of leading progressives, and Chief Justice John Roberts may want to pay particular attention. This week’s leaks show Hillary Clinton ally Neera Tanden laying out a strategy to intimidate the Supreme Court to uphold ObamaCare. Ms. Tanden runs the Center for American Progress, the think tank that is essentially an arm of the Clinton campaign. CAP’s former chief, John Podesta, is now the Clinton campaign chairman, and on June 2, 2015 Ms. Tanden sent an email to Jake Sullivan, a key Clinton aide, copying Mr. Podesta and Jennifer Palmieri, another campaign operative…. ….The left knows how to pick soft political targets and it plays hardball against them. Ms. Tanden won’t comment on the email other than to say that “it’s clear that the Russians are trying to divide us against each other to help Donald Trump.” Her email shows that no matter how cynical you get about progressive methods, it isn’t cynical enough. As we figured, Chief Justice Roberts is not the sharpest knife in the SCOTUS drawer. They played him like the patsy he is and George W Bush knew him to be.